Metroplex Tech is a Dallas Texas IT consulting firm providing comprehensive IT solutions for small to large businesses. Our Dallas computer consultants provide expert-level information technology consulting services at affordable rates - delivering personalized solutions to support your current and future IT needs. From PC technical support, virus removal, network design, new system deployment, firewall implementation to general printer maintenance and even emergency troubleshooting 24 hours a day - 7 days a week. Metroplex Tech has the flexibility to customize our IT Consulting Services to fit your specific needs no matter the size. Call us today- We can help! A SmartHome is a way to automate, integrate, digitally-enable and "future-proof" your home. A SmartHome will have the structured wiring and systems in place to provide a backbone of a homes communication and data communication. A SmartHome is one of those rare advances in which all homeowners benefit. It makes for easier communication within your home and to the outside world. It also allows for greater security and overall better home control. It can save money by allowing the sharing of expensive home theater and audio equipment throughout the entire home. At the same time, homeowners can add about five percent to the resale value of their residence. The purpose of SmartHome is to efficiently distribute, share and interconnect a variety of data signals throughout your home. Modern homes are evolving into Smart Homes. They are a place to stay interconnected with the world. Modern smart homes are a place to be entertained with high definition video, digital audio and interactive controls and a place to be protected with security features that monitor and safeguard your home. The wiring of your home will play a crucial rule in defining your Smart Home capabilities. A SmartHome system installed by Metroplex Tech starts with structured wiring of your home if currently not wired. Once wiring and cabling is in place then we install and configure the "smart" electronic components in a central location such as a closet wall and then we wire each wall plate throughout the house with the desired smart home features such as telephone, computer network and television. What is SmartHome structured wiring? Structured wiring is a method of providing the communications infrastructure of your home through the use of several types of wires and cables that support current and will support future smart home technologies. Structured wiring is installed within wall spaces or in the attic crawlspace so it is not visible. The structured approach is to consistently run a full bundle of wire to every significant room. The full structured bundle of wires often consists of two Cat 5e cables and two coax cables and any other wires needed for custom smart home installation. Usually extra wires are included for any future needs. The ideal time to install structured wiring is while your home is being built. It is much easier and considerably less expensive to run all the cabling throughout your home before the walls are finished. Most new homes are now built with structured wiring in place so it can be used for smart home systems. How does a SmartHome work? A SmartHome system functions like this. 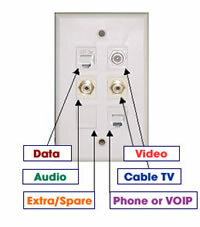 All external data lines (such as cable television, telephone, or Internet) come into the house from outside and are run and connected directly to a central SmartHome control panel. This control panel box is usually the size of a large electric circuit breaker panel, and is placed in a utility closet somewhere inside the house. Within the control box, each incoming signal is split and sent down wires to most of the rooms in the house. Basically these wires wind their way through your walls and attic, ultimately ending at wall outlets or jacks placed throughout your home. You then plug devices into the outlets and use them to provide a multitude of great smarthome functions, such as whole home audio. If you have any questions about our various Smart Home options for your home please Contact Us or give us a call at: (214) 685-0886. Home automation, home automation system, x10 home automation, home security and automation, home automation software, smart home technology, home automation products, smart home wiring, home automation touch screen, smart home automation, home automation design and home automation security system. Home lighting automation, home automation controller, home automation control, home automation wiring, wireless home automation, ge smart home, home automation technology and home automation installation. Home voice automation, smart home system, leviton home automation, smart home, pc home automation, home automation installers, home automation networking, x 10 home automation, home automation equipment and electrical home automation.